Granite is used throughout the exterior and interior of this house in Melbourne, where local studio B.E Architecture even had a bespoke bath and basin for the master ensuite carved out of the grey stone. B.E Architecture designed the three-storey Armadale Residence for a couple who wanted to downsize from a large family house to a more compact and bespoke property in the inner suburb of Armadale. The owners wanted the house to be flexible enough to accommodate their adult children when they visit, while providing a series of spaces that are custom-made to meet their everyday needs. The building is hidden from the street behind a privacy fence containing a gate that opens onto a front yard planted with a grove of Japanese cherry trees. 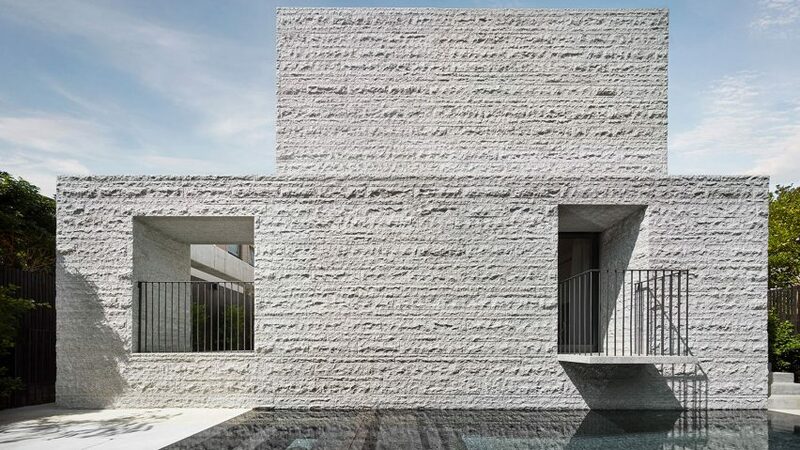 A first look at the house reveals the monolithic character resulting from the solid granite surfaces, which form predominantly closed facaded punctuated only by openings incorporating slatted timber screens. The cladding is formed from 260 tonnes of the igneous rock, which is finished with a split-face effect to create a rugged surface that is animated by the sun passing over it throughout the day. "The natural texture and irregularity of the split-faced material blurs the hard lines of the stacked rectilinear building," said the architects. "While the building is strong it sits quietly in its surroundings." A paved pathway leads from the entrance gate towards a main door set back beneath a cantilevered section of the upper floor. A separate gate provides access to a ramp descending to the basement garage. 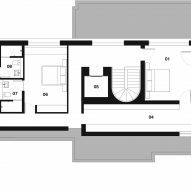 The basement also accommodates a study, gym and cellar, with a lift and staircase connecting these subterranean spaces with the two upper floors. The use of granite extends into the interiors, where the stone is used for flooring and other surfaces. The result is a consistency that particularly helps to enhance the connection between the rooms and several adjoining outdoor spaces. The main living area towards the rear of the property is lined on one side with sliding glass doors that retract to open this space up to a narrow courtyard floored with the same granite slabs as used indoors. The architects worked closely with the builders and stone masons to achieve a high level of architectural detailing and craftsmanship throughout the project, ensuring that the granite performs both as cladding and as a refined interior material. "Working together, we were able to create subtle variation in the materials and intricate details where slight change finish makes the same material fit for different function or application," said B.E Architecture. "In a few places this required thinking of atypical applications for the stone," the studio added, "working with suppliers to push custom fabrications to add to the overall unification, especially in the master ensuite where a custom bath and basin were engineered from solid blocks of stone." According to the firm, the granite surfaces lend the building a sense of permanence and strength that is mediated by the brightness and openness of the spaces. Natural light is a feature of every room and is also introduced into the central circulation areas by interventions such as a circular skylight above the spiralling staircase. The landscaping of the outdoor areas is carefully considered to provide views of greenery from inside without relying on a high-maintenance lawn. 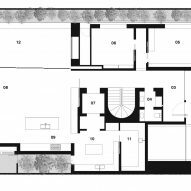 A secluded garden alongside the master bedroom on the top floor features a cluster of trees and a paved pathway leading to an outdoor shower. B.E Architecture has designed several residences in the Australian city, including one with a drystone wall framing a series of glazed pavilions and another featuring glass rooms that open onto terraces topped with a copper-edged balcony. Photography is by Peter Clarke.